And the rock it rode in on! Chicxulub Crater is the remnant of the impact event that led to the extinction of the dinosaurs. Everyone knows a big rock hit the Earth and killed all of the dinosaurs, but this is a gross oversimplification, kind of like saying Henry Ford popularized the automated assembly line and now people drive cars. A lot of bad things happened between an apocalyptic rock and 75 percent of all life of Earth getting wiped out, but we’ll go over that over the next few hundred words. Chicxulub Crater was discovered in the 1970s while geophysicists were probing about the Yucatan Peninsula in Mexico for oil. Keep in mind, it’s a 66 million-year-old crater, and the Earth has moved around a lot since it was formed. It wasn’t just a big bowl on the surface — it’s been covered by tens of millions of years of erosion and moved around by plate tectonics. Scientists pulled samples from the crater that include shocked quartz (quartz that has undergone extreme heat and pressure changes achieved by sudden impacts) as well as tektites, which are bits of natural glass that used to be silicates before getting walloped with something hot moving very fast. 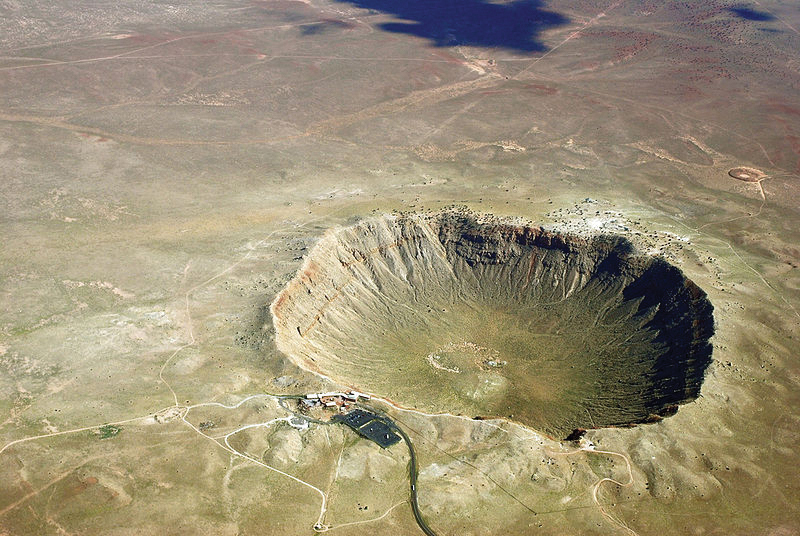 How do we know that this is really a crater if we can’t see it, and how do we even know it was some kind of meteorite and not aliens nuking or abducting dinosaurs? The cool thing about rock is that it doesn’t lie, and that stuff that happens to fall on rock creates handy layers we can use to date geological events like major volcanic eruptions and, you guessed it: meteorite impacts. In samples all over the world, there is a stark layer marking the K-Pg extinction event with a thin little strip of iridium, an element that’s rare on Earth, but abundant in asteroids. The fact that this stuff was found all over the world shows something big happened, and there was enough ejecta to be flung to the far corners of the globe. The crater itself is believed to have a diameter of 93 to 112 miles. The energy released by this impact was at least a billion times stronger than the atomic bombs dropped on Japan in World War 2. The meteorite itself was at least nine miles wide; had it been laid gently upon the Earth, it would cover everything between Ponderay and Trestle Creek and look really cool from Schweitzer Mountain. At the time of impact, anything within hundreds of miles was instantly killed by a mix of infrared radiation and the shockwave of the impact. What followed was years, perhaps decades of what we consider nuclear winter. After the impact, molten ejecta rained back down. This caused innumerable forests to catch fire, pushing immense amounts of carbon dioxide into the atmosphere to create false clouds that would choke out sunlight. Carbon in the atmosphere usually causes the atmosphere of a planet to heat dramatically with a greenhouse effect. The heat enters, it gets trapped and takes a long time to filter out just like with a greenhouse, or the inside of your car this time of year. In the case of the impact, however, all of the dust and debris in the atmosphere blocked sunlight and caused surface temperatures to plummet. It also inhibited plants from generating energy through photosynthesis, which caused a massive chain reaction in the food chain. Plants died, then the giant herbivores that sustained themselves from them, then the carnivores that ate the herbivores until only small, scrappy animals survived. Certain types of volcanic eruptions cause a similar global winter effect. Plinian eruptions like Mt. St. Helens or Mt. Vesuvius can cause global cooling by choking out sunlight with ash, but it’s ultra-plinian eruptions like the 1815 eruption of Mt. Tambora or the Yellowstone eruption 630,000 years ago that can cause the entire planet to drop several degrees in temperature for decades or even usher in ice ages. It seems to be a built-in way for the planet to cool itself off to sustain life over a long period of time, at the cost of … well … killing everything. The impact happened in a shallow sea, which caused a 330-foot megatsunami. Had it occurred in the deep ocean, however, it would’ve created a wall of water 2.9 miles high. That would be like stacking Burj Khalifa atop itself five times. Cowabunga, dude! The impact was a terrible time for life on Earth, at least right away, but it opened the door for new life to flourish. Had the giant terrestrial lizards not been wiped out, our oldest ancestors would not have flourished enough to give us a chance to dominate the planet as a species. The last common ancestor of all placental mammals from squirrels to horses to dogs to humans emerged about 400,000 years after the impact, once all of the dinosaurs were long gone. It’s weird to think about, but because of a rock that fell out of the sky, you exist to read this paper. It’s even weirder to think that you and your dog both share a great, great, great (This goes on several hundred million times.) grandmother.